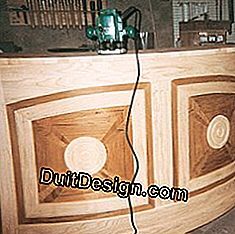 This superb bar has all the appearance of a talented cabinetmaker. But in reality, it is made from a carcass of plywood and MDF. 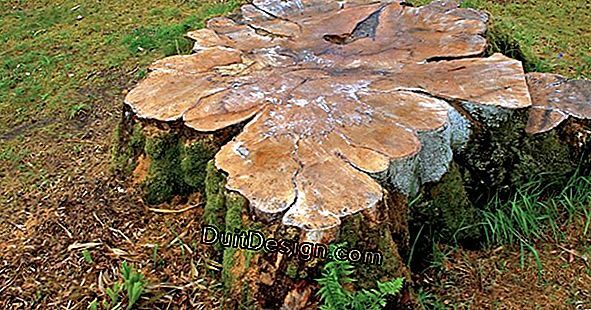 The ash elements are reported on, as well as the teak veneer. This is a fairly simple realization for who can devote time. 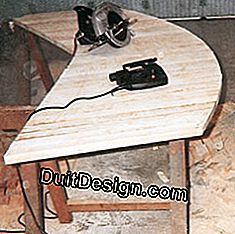 Making a curved piece of furniture is a delicate work, and above all, a greedy piece of wood. 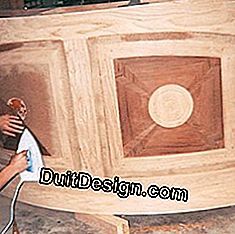 Hence the interest of working by veneering on a frame, as is done in traditional cabinetry. This is the solution chosen by Laurent Boursin to realize his bar, without resorting to conventional assemblies, which he preferred a simple screwing. The decor was obtained by gluing and juxtaposing thin strips of wood. As for the upper plate, it is made of glue-laminated home-made. Nice work! The facade of the furniture is the centerpiece. 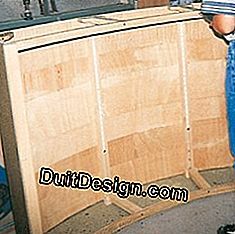 Made on a mold made of two layers of plywood, it is lined with a 3 mm MDF sheet. Both sides are of similar structure, but planes. Front and sides, at 120° from each other, are connected by 60° cuts. 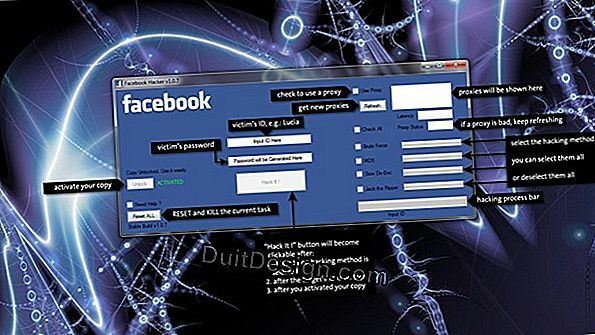 ■ Six amounts reinforce the whole. Those behind, grooved, come nest on the edge of the sides. Those placed in the angle between sides and facade are profiled to marry the angle to 120°. The last two studs, applied behind the facade, intersect it in three roughly equal parts. These remain flat, the curve of the panel being negligible compared to their width. Racks inserted into these uprights support the melamine shelves. ■ Two arched ties, one on the floor and the other at the top, connect the sides at the back. They are made of four layers of ash laminated. Their ends are cut to connect in the angle formed by the sides and the amounts. Four spacers maintain the spacing between sleepers and facade, to the right of the uprights. 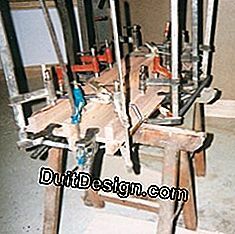 All these elements are assembled by simple gluing and screwing, without any tenon or mortise. ■ The tray is made of a series of ash blades arranged in the width direction. To facilitate its attachment to the carcass, connecting reinforcements are added to the latter at the connection of the spacers and cross members with the sides and the facade. The screwing from below is thus easier. Glued to the frame, solid ash elements, mostly 8 mm thick, simulate traditional manufacturing. Front and sides are adorned with a frame, consisting of two uprights and two crosspieces, and completed at its base by a plinth. The inside of the sides is "closed"By a false panel hat reported the police.The facade is closed by two false doors, overlooking a central amount embellished with three grooves.The upper rails of the doors, and that of the frame that surmounts them, are curved. ■ The border of the side panels is represented by a teak veneer. This same material embellishes the false panels of the doors, skilfully arranged according to their diagonals. A central medallion in solid ash 15 mm thick, partially embedded in the frame, completes the decor. ■ Two curved handrails adorn the top and bottom of the facade. Made by laminating, like the cross members of the frame, they are then rounded and installed on supports stair railing. Their ends are complemented by end caps curtain rods. The whole, carefully sanded, is treated in the background before receiving two coats of marine varnish. Initial and essential step of the realization, the purity is directly established on the two boards of agglomerate intended to form the flanges of the mold. No less than six circular arcs, perfectly concentric, are to represent: the contours of the plateau, the layout of the cross-members of the frame, and the thickness of the facade. ■ The two flanges are then assembled by a series of fir cleats to form the framework of the mold. These cleats are arranged slightly behind the inner curve of the facade panel. Wooden slats of 7 mm thick are screwed on these cleats to refine the curve. 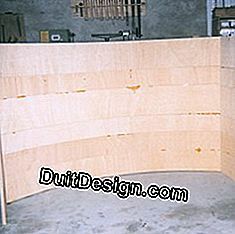 The plywood prepared in strips 15 and 20 cm wide and the MDF lining are glued and placed on the mold. A second series of cleats, screwed obliquely in the chipboard flanges, just close the mold during drying. The side panels, prepared identically, are simply pressed between cleats. After drying, the three pieces are cut to size and their bevelled edges bevelled at 60°. ■ Other framing members are prepared during drying, except for the rear cross members. Made of four layers of ash laminated, they can be made, with the handrails, once the mold released. The amounts are profiled according to their future location. The edges of the sleepers are planed, then their ends conform to the desired angle. ■ After checking, the entire frame is glued and screwed. Finally, it remains to manufacture and adjust the support reinforcements of the tray and the lower shelf, taken from falls, and screw them in place. Whether massive or plated, all the elements attached to the carcass are made from cardboard jigs. 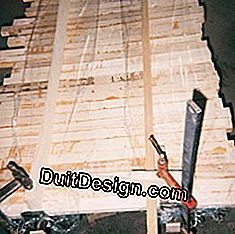 The ash elements are prepared from slats planed to 8 mm thick. Some are formed of a single blade, others of several glued side by side. They are then cut according to the cardboard templates made from the outline, and their songs carefully sanded. ■ The grooves, grooves and notches allowing to juxtapose these parts while masking their fixing screws, are machined to the router. Just like the flutes of the central pillar and medallions. In the corners, the studs are mitered as well as the skirting boards. 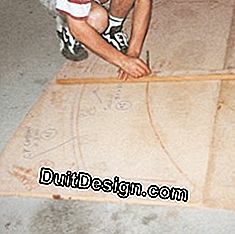 ■ Templates are used to trace the location of parts on the MDF and to facilitate installation. 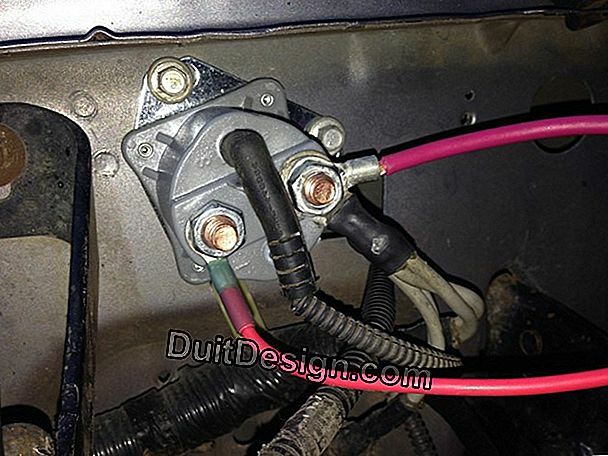 These are glued and screwed in place respecting the logical order imposed by the assemblies. 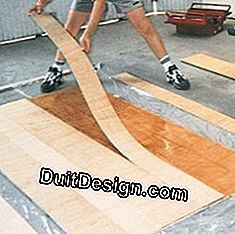 The veneer elements, carefully cut with a cutter, are installed in their turn. The location of the medallions is superficially smashed to allow their discrete interlocking on the rounded surface. 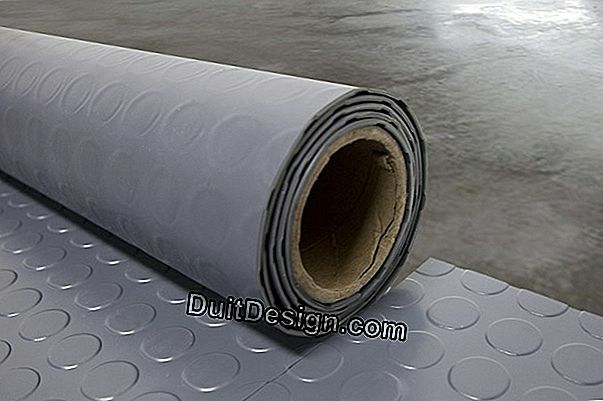 Self-manufacturing a bonded laminated piece is not complex, but the care required grows proportionally to the size of the item. 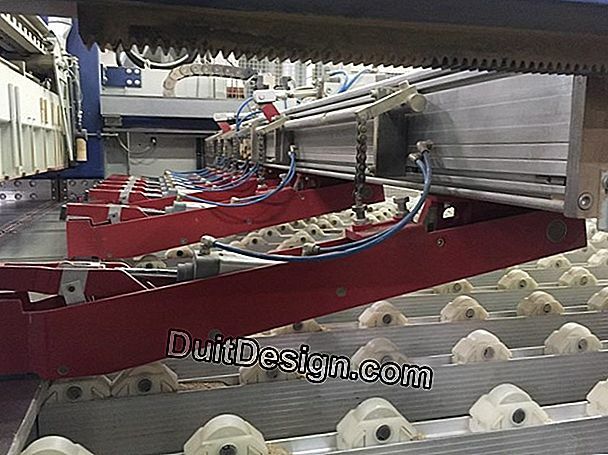 The blades of the tray are therefore rigorously stripped and planed to assemble without leaving days. They are then glued one by one and positioned on sleepers. ■ The latter ensure the only end tightening. 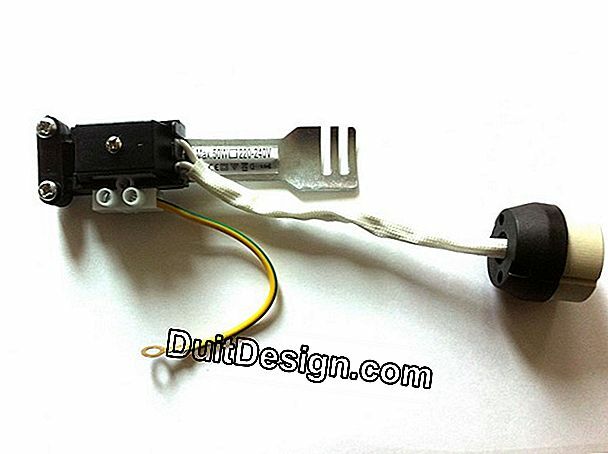 The flatness of the assembly is obtained with two cleats clamped by clamps to take the sandwich tray. After drying, shaping the tray with a jigsaw is almost a formality. He then remains to screw it to the carcass through the reinforcements, then to flush his songs. There is no question of botching the finish of such a piece of furniture. 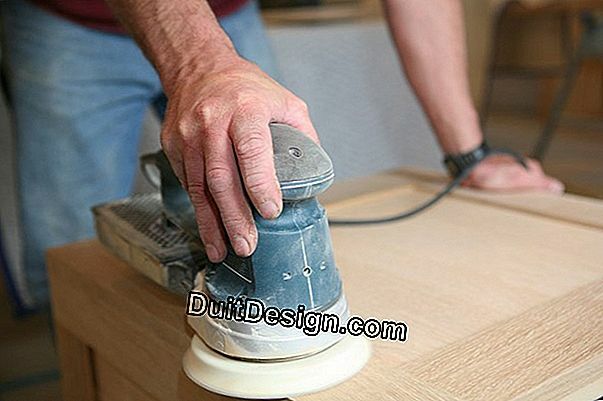 The sanding is meticulous, taking care not to pass through the fragile veneer. The initial, carefully gummed layer of fade is followed by two coats of varnish, with a new ginning between the two. Remain to put in place the handrails and the cabochons. Ultimate precaution: if the marine varnish is solid, watch out for drinks "too corrosive"! The use of strips greatly complicates handling during the production of the facade panel. 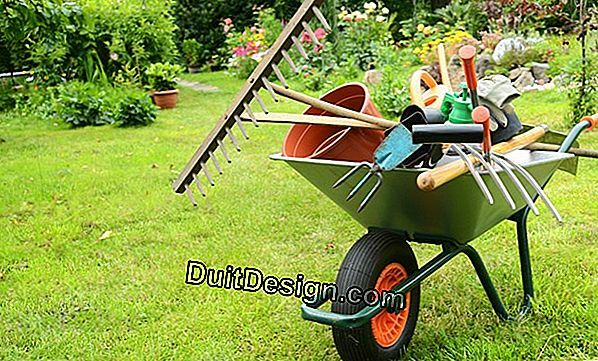 In spite of an additional cost, it would be preferable to use large boards of pliable bent, cut to the desired dimensions and directly shaped on the mold. 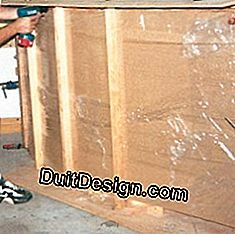 No need to clutter with paper: the sketch is drawn directly on the panels that will become the flanks of the bending mold. The lines, concentric, are carried out with a compass. The flanks of the mold are connected by pine cleats, arranged behind the outline of the inner face of the facade. A few wooden slats, planed to 7 mm thick, will complete the roundness. A first series of strips of plywood, alternating 150 and 200 mm wide, is arranged on a plastic film and glued. The second layer is laid in overlap, alternately reversed. 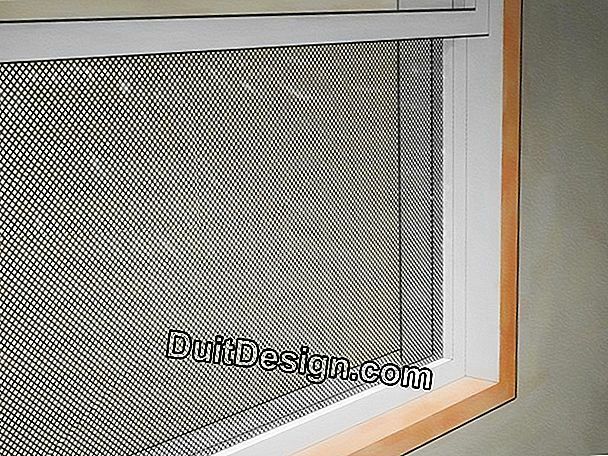 After adding the MDF sheet, the plastic film is closed to prevent glue burrs. 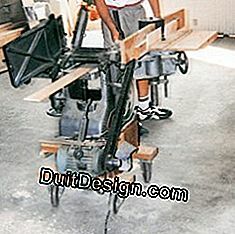 The assembly is transferred to the mold, clamped in shape by clamps and a second series of cleats. The side panels are identical to that of the facade. 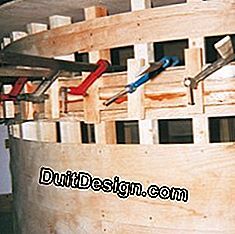 Plans, however, they do not need shaping mold: some cleats and a collection of clamps will suffice. The ends of the facade close the sides at an angle of 120°. After cut to size, the edges of the three panels are profiled at 60° to allow their precise assembly. The mold resumes service to fabricate the sleepers of the framework and the handrails. 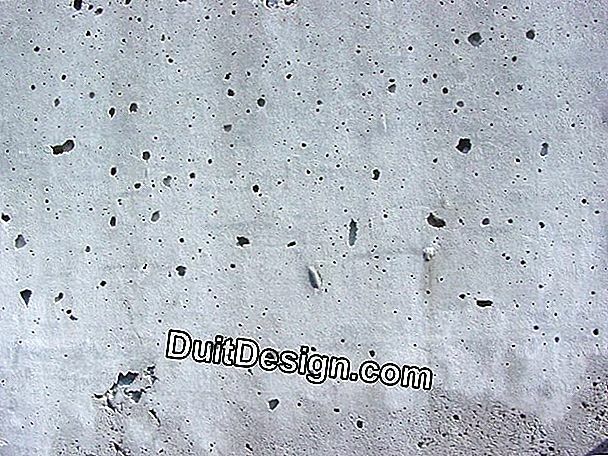 Before formatting, these four elements are identical, formed of four layers of ash laminated. The songs of the sleepers are then planed, and their ends resized. The edges of the handrails will be rounded with the 1/4 round cutter, interrupting the molding to the right of the supports. The frame of the bar has no traditional assembly: the elements are simply glued and screwed together. 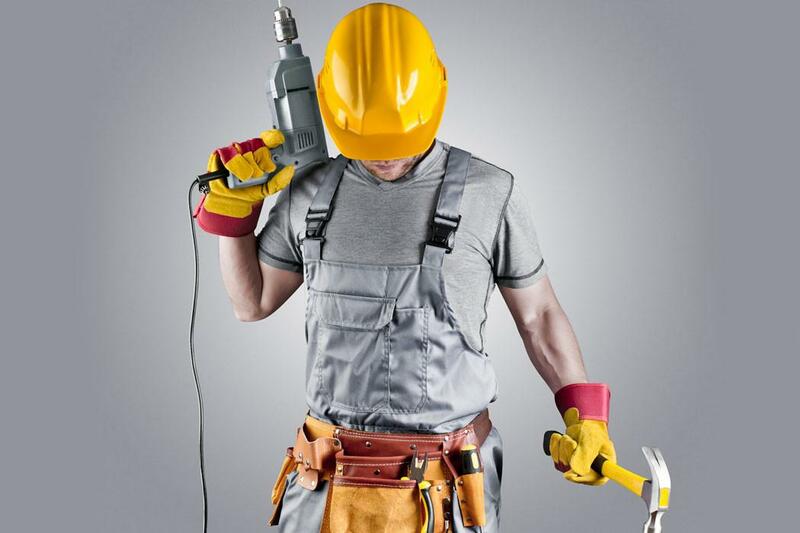 In facing, the heads of the screws will disappear behind the massive elements brought back. The majority of solid wood inserts are drawn from planed ash boards 8 mm thick. Only skirting boards are slightly thicker (10 mm), as are medallions (15 mm). The false high cross of the facade and the two - no less false - upper door rails, curved, are cut with a jigsaw. The sawing traces are then carefully sanded. 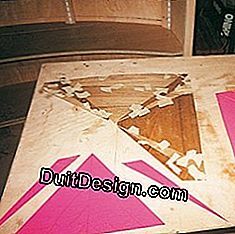 The pieces of the veneer are cut using cardboard templates, themselves obtained from a single starting square. To avoid mistakes, the assembly is tested with masking tape. 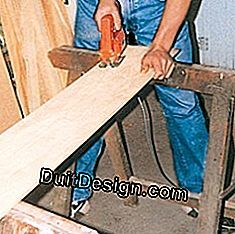 The use of pre-glued veneer greatly facilitates installation since the only tool needed is an old reformed iron. Another advantage, the repositioning in case of error is easy. The tray is made with carefully planed ash slats, glued, and assembled flat between two frames and two cleats. A plastic film prevents the glue from drooling on these. 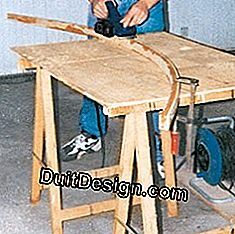 The general shape of the tray is then rough cut with a circular saw, then refined with a jigsaw. 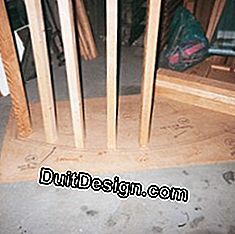 One of the flanks of the mold of the frame, now useless, can if necessary serve as a template. After sanding, the tray is precisely positioned on the framework and then screwed underneath thanks to the connecting elements prepared for this purpose. It still remains to flush the songs to the router. Ventilate well at home for healthy, moisture-free air.